It's a rare thing for the last book to be better than the two that came before it, but Ashes to Ashes achieves it. 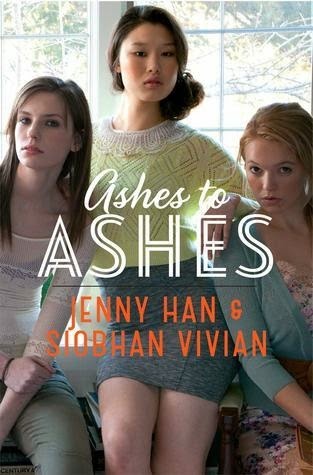 Jenny Han and Siobhan Vivian really turned things up a notch at the end of Burn for Burn and did not stop for this entire novel. Wow. At the beginning of the book, the reader and Mary know she is dead, but her only friends, Lillia and Kat, do not. They also do not know that she is furious with them and wants revenge, not only against Reeve, but also against them for breaking their pact. Mary has all the time in the world, but for everyone else, time is running out. As I mentioned in my previous reviews, I loved the Lillia chapters the most. They are obviously written by Han, her hand is obvious in the details and how the family is similar to Han's other books (and possibly, her own life). I love that there is an Asian protagonist who is the most beautiful girl in school, not relegated to the best friend role (Lane Kim from "Gilmore Girls" comes to mind.) We need more diversity in books and the beautiful model portraying Lillia on the cover of the books adds to that. I hate to spoil books, so I will just say that I am happy with the ending. The resolution features a flash forward to the futures of the characters, which I love. The future of the characters is bittersweet and how it should be. It's fun to be able to recommend a series that just gets stronger. This is one that my ninth graders will adore.